In 2008, a pirate metal band from Scotland broke into the metal scene with one of the most ridiculous debuts in history. A decade later, Alestorm are still here. How did this happen?! It’s the quintessential festival scene: a field in Europe, thousands of faces stretching into the distance, all captivated by the spectacle onstage. A band, instruments in hand, feeding on the din as everybody roars along to every word. Heads bang. Horns are raised. Bodies… row? This isn’t Metallica, Iron Maiden or Guns N’ Roses playing a headline set – it’s Alestorm at Graspop 2017. Common sense dictates that any metal band who can shift over 500,000 records worldwide, fill fields and clubs alike throughout Europe and beyond, and potentially lay claim to kickstarting a whole subgenre would be a Big Deal. But with Alestorm, common sense seldom comes into play. Largely dismissed by critics as a joke band, the band are nonetheless going strong on the 10th anniversary of their debut, Captain Morgan’s Revenge. Fifth album No Grave But The Sea, released last May, reached their highest chart positions yet and led to a summer of festival madness. It’s fair to say that this is more than just a flash-in-the-pan gimmick thing, then. The song – Heavy Metal Pirates – actually pre-dates Alestorm, and was originally written and released for Christopher’s first band, Battleheart. Decidedly more power metal-oriented than Alestorm, Battleheart nonetheless laid the foundation for the more bombastic sound that would bring Chris and co so much success – and before you ask, no, they weren’t influenced by long-running, history-obsessed metallers Running Wild. Instead, they channelled the wave of Finnish folk metal that was gaining momentum, taking inspiration from Korpiklaani, Ensiferum and Turisas, and adding in the over-the-top sound of countrymen such as Children Of Bodom. Love it or loathe it, pirate metal has certainly shown its staying power over the past decade, confounding critics as to how a simple gimmick could enjoy such longevity. 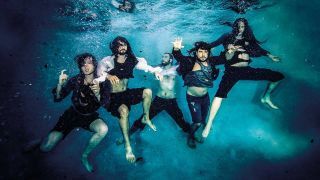 In the 10 years since releasing their debut record, Captain Morgan’s Revenge, Alestorm have built one of the most vocal – and visible – fanbases in metal. Their last three albums have entered the charts, with No Grave... landing Top 50 positions in the UK, the US and Germany. Their Spotify Top 10 tracks boast well over a million plays each, with the top song, Drink, hitting the 10million mark. Metal is full of bands who are able to embrace the genre’s most ludicrous elements and capture the imagination nonetheless. Iron Maiden have forged a near-40-year-career doing it, Amon Amarth headline festivals because of it and Ghost embody its enduring appeal. The success of Alestorm isn’t anomalous – it’s coded into metal’s very DNA to love something unabashedly joyous and heavy. And they’re still rising. Alestorm are playing the main stage of Bloodstock on Saturday August 11. Tickets for Bloodstock are available now.